March 13, 2018 / Valerie Wilson Travel, Inc.
Baglioni Hotel London is the only true Italian luxury boutique hotel in the heart of Kensington, one of the most elegant and sought-after areas in London. You can feel the Italian heritage as soon as you enter the unique property. The entire décor is designed in Milan by Spagnulo & Partners and the wooden floor, furniture and wall tapisserie comes from the fashion capital of Italy but also from Rome, Venice and Sicily. 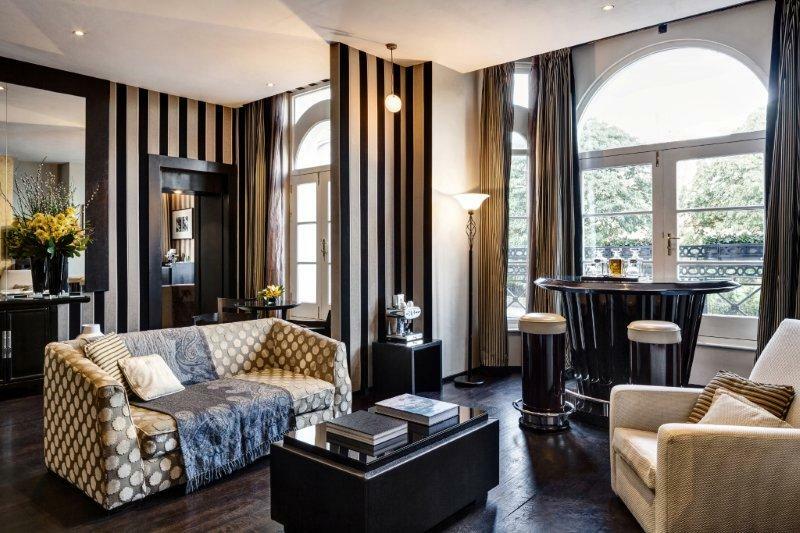 The very precious Kensington Suite is located on the first floor of the Baglioni Hotel London, and like all Victorian buildings in the UK, you can expect high ceilings and large windows. You will enjoy breathtaking views into the most elegant area of Hyde Park: Kensington Gardens. The famous Kensington Palace, home to part of the Royal family, is just opposite the hotel. The 915 square foot Kensington Suite can be connected with the two-bedroom Hyde Park Suite to become the prestigious 2,585 square foot Royal Suite, offering in total three bedrooms, two lounges, three and a half bathrooms, two balconies and a small terrace. The stylish black marble and granite bathrooms feature handmade copper sinks from Sicily, the same city where the elegant Ortigia amenities originate from. It comes with a huge bath tub and walk in shower. What would be your advice for a first-time guest visiting? Kensington is very rich in culture and history. A lot of families and couples enjoy main attractions on our doorsteps. Take advantage of visiting the Diana Fashion Exhibition at Kensington Palace, enjoy one of the many classical concerts at the Royal Albert Hall or just take a walk down the road to the Victoria & Albert Museum to explore some of the most internationally-acclaimed exhibitions. Some of this year’s museum highlights include Opera, Ocean Liners, and for the first time out of Mexico, Frida Khalo. What was your favorite feedback or comment received from past guests? My terrace and balcony are always looked out for. They provide the best setting for a royal breakfast facing Kensington Gardens (sometimes I even get a glimpse of Will and Kate, and soon Harry and Meghan, perhaps!). When the families stay with me, they love spending time in my lounge in front of the enchanting fireplace either with a hot chocolate and cookies or delicious smoothies brought up by my friends from Brunello Bar and Restaurant. What is a typical day in the life of a suite? No day seems typical in the heart of Kensington. I am one of the most popular suites in London and the perfect choice especially near Hyde Park. The guests that enjoy my hospitality find it hard to say “arrivederci” to me, and same for myself. Sometimes I host exclusive dinners for families and their friends which makes me feel loved. Some of the best days are when I am hosting glamourous fashion shows. The people that come through my door never fail to interest me and I always look forward to the next visitor. 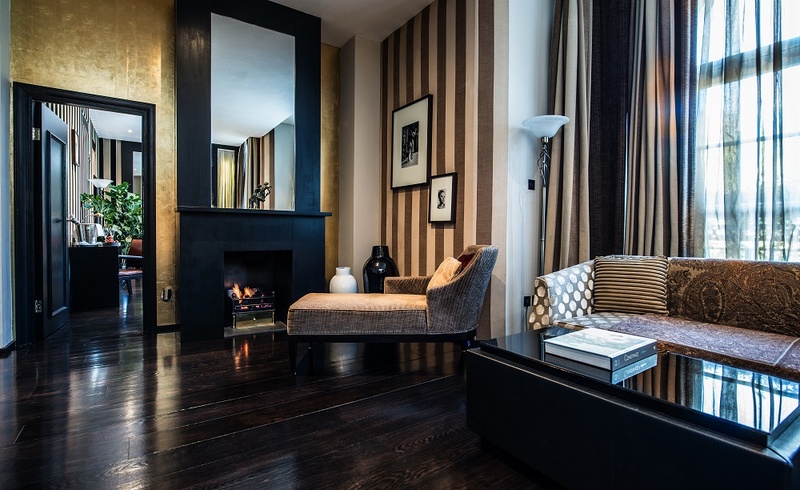 Click here to learn more about Baglioni Hotel London and the Valerie Wilson Travel Suite Access™ benefits available to you.